Thought that we would share this particular photo from yesterday's tour - it struck us as being really unique and unusual with the fish swimming behind this huge piece of fan coral and only their silhouettes showing. Nice. Hope you enjoy! July 16 brought on a pleasant enough day in Grand Cayman, offering the the full gamut of tropical conditions throughout the day, which means never a dull moment! On this day we hosted a private tour for two wonderful guests from the Ritz Carlton. 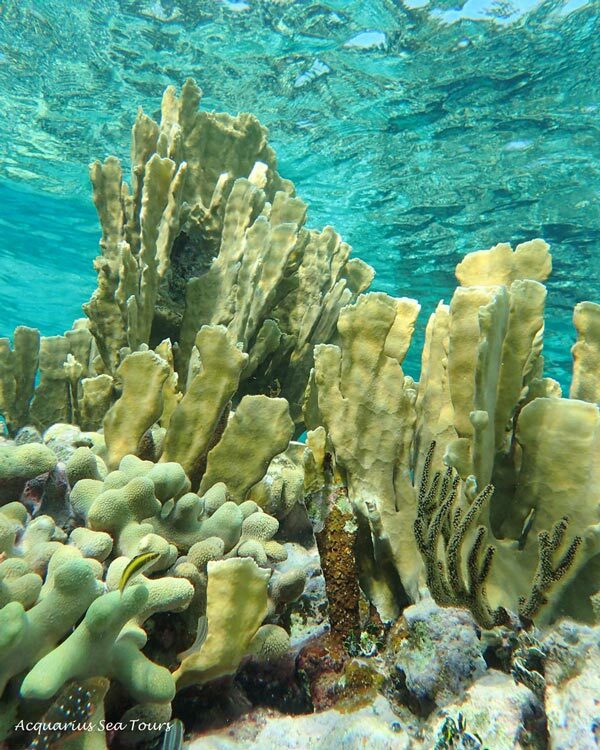 On the itinerary were the ever popular attractions Stingray City Sandbar and Starfish Point, but being great lovers of snorkelling, it was a great pleasure to take them some of the best snorkel sites that can be found along and near the Cayman Reef. The caribbean waters were relatively clear and showed up splendid colours. Some of the best sightings were of the coral, gorgeous colours along the reef as well as sightings of tropical fish such Angel Fish, Blue Tang and a Yellow Stingray to name a few. A great excursion which we hope left our guests happy - we know our crew just loved every moment with them and returned feeling all "at one with nature"! It can be hard to believe that weather can change so many times in such a short time, but our 3.5 hour tour yesterday experienced the full spectrum, from stunning caribbean sun to tropical storm and everything in between. The photos below give some idea of the difference whilst visiting Starfish Point .... for approximately 25 minutes! Many times we are asked if the weather looks good - a difficult query to answer with certainty because of the above. We know that our guests want the very best possible conditions and wish we could guarantee this. We can't. However, Captain Mario does have a pretty good gut feeling when it comes to the weather and very seldom gets caught by surprise (and is rather grumpy if it happens) becausehe genuinely wants the best for those on board. On a recent tour, Captain Mario took a picture of this stunning piece of coral which he has named "Mandy's heart". 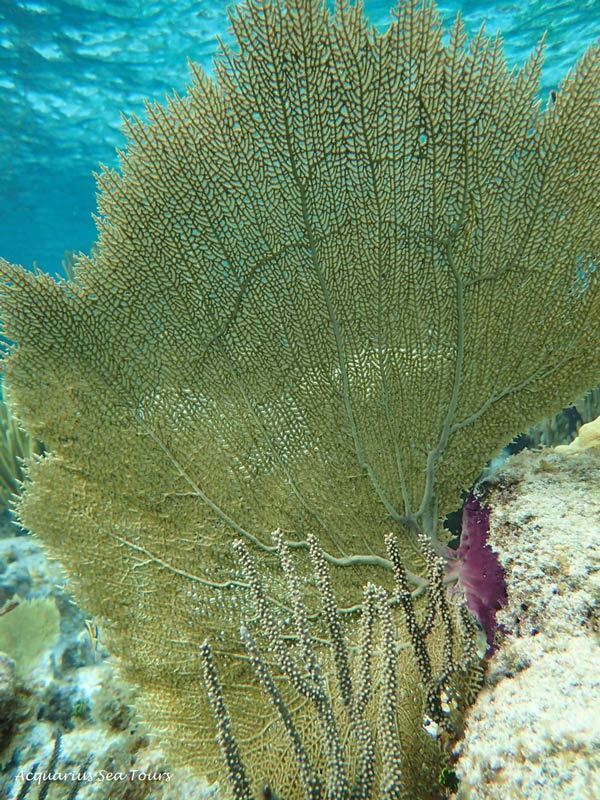 It is a glorious piece of Brain Coral and is a part of the Barrier Reef found in the North Sound of Grand Cayman. It measures approximately 3 feet x 1.5 feet. 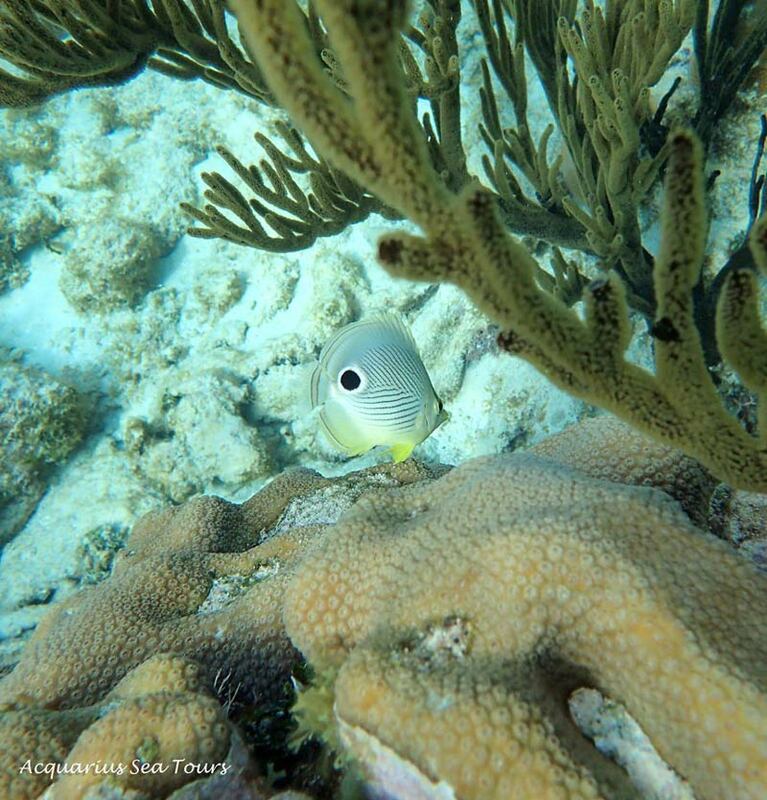 This can be found in relatively shallow waters and can be seen while snorkelling - so no need to be a scuba diver! It has formed a heart shape with a few "scars" in it, and never fails to raise a smile from Captain Mario for whom it has special meaning. We hope you like the photo and are also in awe of the wonder works of nature that have created this. So precious and so utterly, beautifully, delicate. Hope we get the chance to one day host you and take you to visit it! It has been our problem to sit down and write news of our excursions lately, however, we occasionally come across photos which just have to be shared (like the one in the previous post!). So here you go - enjoy - hope that we get to write some news for you soon! It has been a little time since we last blogged. There has been plenty to blog about, but so little time to actually put it together. To begin with, we are so, so grateful to have seen the worst of the weather gone. That was a very tough few months and some of the worst conditions that we have experienced in decades. Needless to say, every hour of Caribbean sun that we are getting now is LOVED (I am sure island visitors are feeling the same!). Starfish Point has been exquisite and we have shared a ton of photos with our guests - we provide them free of charge and we hope that they love their vacation photos. The photo not only captures how beautiful it is, but also how clear the waters have been this week (more photos below!). This fellow is nocturnal and usually only comes out of hiding in the sand at night to enjoy it's prey - it is a carnivore and likes to munch on molluscs and gastropods such as the queen conch. It transfers its prey to its mouth using it's arms and swallows it whole, later regurgitating undigested leftovers. It was a great little find and we have enjoyed sharing the pics and the info with you! As we were saying above, we have been blessed over the last two weeks with great conditions (this past Wednesday being the only day that was so bad we had to cancel tours), and we promised to share some photos - so here they are - enjoy! We do not cancel tours for fun or on a whim. We are a family business and rely financially on every tour that goes out. We understand that when there is sun in the sky and Seven Mile Beach looks like a pool, guests might become angry and frustrated when we cancel tours due to unsafe weather conditions. We understand if you are on a once in a life time cruise vacation and just can't bear the thought of missing something as special as Stingray City. But safety must come first. When we posted this collage onto our Facebook page on March 6 at 9:30pm, little did we know about a missing sea vessel which was causing a swell of concern. Below is the photo that we used to make a point - the photos on the left were taken at around 11:00am and the photos on the right at about 4:30pm - same tour, same stops, but completely different conditions. These are the tropics, and weather can change from idyllic to quite the opposite within just a few hours. Captain Mario remembers quite clearly a small fishing boat making its way across the North Sound during his morning tour. He remembers its shape which was a little different from the normal design. He remembers a guest asking why the boat was all blue. He remembers wondering where they were off to and hoping it was not far. We are praying with all our might while our hearts grow colder with dread with each passing hour. We pray for the safe return of all 5 occupants, but mostly for the young children on board, going out on their first fishing trip. Come home. Come back. Come wipe away the frowns of worry, come wipe away the tears of fear. Come tell us it is not true. This Friday past offered up amazing conditions with beautiful colour and smooth waters. We managed to get this shot just as the sun started going down, standing on the sandbar where Stingray City in Grand Cayman is located ... an incredible moment! Families that snorkel together, keep memories forever! If you have read our past posts, you will be well aware of the awful conditions that we have experienced for way too long, resulting in countless tours being cancelled and so, so many disappointed guests. We are seeing some relief from this unusual weather - last week we managed to get out for 2 days, and this week we have also managed a couple of days. This has been very tough on the local operators during what is considered to be the highest season of the year. What is amazing, are the days of total calm between all the storms which truly brings to life the saying "the calm before the storm", although we are changing that to "the calm between the storms" for this year! Of course, being able to go ahead with excursions with guests concerned that they might miss this experience with the stingrays, and ants-in-the-pants crew members, engenders a lot of excitement which is almost palpable. And so it was a great big cherry on the top when we spotted these beautiful morays at the snorkeling site we chose for the day. We know Elvis the Green Moray very well, and occasionally spot another Green Moray along Cayman's North Sound reef, but to find these two morays at the Coral Gardens AND right next to each was just amazing! The Caribbean water was amazing clear and Captain Mario managed to get this stunning shot! The Viper Moray is the dark one, closer to you the viewer. They usually reach a maximum of 3 feet in lengths, are dark over their entire bodies, and have very arched jaws which only touch at the tip of the mouth, thus constantly displaying their impressive teeth. They are generally nocturnal fish and feed on fish or octopus. The above photo shows a well known characteristic of them - their sit and wait approach to feeding - sticking their heads out of the coral and waiting until dinner swims past and wham! dinner is done. The prettier one behind the Viper Moray is called a Goldentail Moray - far lighter background colouring with dots that spread over the body. The dots start small in size on the snout and progressively grow bigger towards the tail. They are small and are not expected to reach a length greater than 2 feet. They have tiny teeth which are used during night forays to catch themselves acarnivorous meal - usually solitary creatures, so the above picture shows an unusual behaviour. We had some divers out on the boat with us for this tour, and they were so incredibly in awe at finding these moray during a snorkel, as was Captain Moray who was over the moon at spotting them. We hope they stay for a long time and that we can visit them frequently and show them to our guests who, we are sure, will equally enjoy seeing these marvellous fish! Please people. They do not belong on your head. They choke as soon as they are taken out of water. Leave them in the water. Let them live longer so that our kids can also enjoy them one day. THINK! If you have been reading our previous posts, you will know that we have been suffering great agony caused by weather conditions forcing the cancellation of way, way too many tours for far too long. We were so looking forward to a predicted break in the weather on 17 and 18 February - boat traffic was crazy as can be expected, with nearly anyone with a boat that still floats trying to get out to Stingray City before conditions could turn for the worse. And boy oh boy were we rewarded for our excitement with the most stunning scenery all around, and a wonderful surprise waiting for us under the water's surface at the snorkel site. Showing her best side - oh what a beauty! On board with us we had a couple who had been abandoned by another operator, - they found us & decided to hop onto the afternoon tour with us. They were enthusiastic divers and also had an enormous love for sea life, so what an amazing experience it was for them to see this young eel who is new to the area. She certainly seemed to enjoy posing for our Captain Mario and he managed to get some great shots of her! What a brilliant surprise to clear up all the gloom - she has us buzzing with excitement! Let's hope she makes her stay a long one - we look forward to greeting her every now and then! You prefer this side perhaps? Oh my, we have been crying with frustration at the weather conditions which have forced so, so many cancelled tours over the last few month! The crew have also been going into stingray withdrawal and getting quite craggy about it! So, yesterday's break in the weather cause great, great excitement and it was such a pleasure to take our guests out and to be kissing the "girls" again - loved each and every moment! Today is also nice out, but it looks like the bad stuff might be back again tomorrow. Oh well. Just gotta keep saying our prayers! We share some of the photos from yesterday's tour - enjoy! It did not take long for Mr Richard Branson's somewhat flippant remarks about being "attacked" at Stingray City in Grand Cayman to cause ripples of panic among those wishing to visit this world famous spot. Reputable local operators are shaking their heads at this "news" article. This negative publicity will now only cause a wave of fear from prospective guests at a time when weather conditions over the last 6-8 weeks have forced an unprecedented number of cancelled tours, causing tremendous financial losses to an industry which is supposed to be at it's highest point for the year. But to start educating the public at large all over again about the gentle nature of these awesome stingrays is a re-hash of the times experienced after the unfortunate death of Steve Irwin some years ago. Our very own Captain Mario decided to have his say, and here it is. "Our information is that Richard Branson went out with Guy Harvey who is not a professional tour operator to the Stingray City Sandbar. Knowing that he carries out research on the stingrays, it can be assumed that their relationship with the stingrays is not a positive one based on respect, love and reward. I have witnessed Guy Harvey's research team bait the stingrays in order to capture one with a net, wrestle it out of the water (which causes immense stress), drag it into a portable kiddies pool on-board and then cut a chunk of meat out of the wing. I would not enjoy this kind of handling, would you? This leads to a frantic "feed without being caught" scenario which is not necessarily a safe one. The Southern Stingray (Dasyatis Americana) are a peaceful and non-confrontational animal. The local reputable professional tour operator will have known them for years, will recognize them and know them by name. Some of the girls are Frisby aka Barbara, Scar Face, Dark Vader, Droopy, Lilly, Snow Flake - and many more - each has it's own personality and characteristic. The good operators treat them with the love and respect they so deserve, and will also ensure that their guests do the same. We will report injuries or suspected illnesses to the Department of Environment and will come to their defence if we observe anyone treating them badly." We urge visitors not to fall prey to what is a somewhat tongue in cheek account of being "attacked". We do urge visitors to choose a reputable tour operator who will guide you to having an incredible experience with these awesome creatures. We promise that they will change your life forever, in a good way. And we promise you that you will never look at Mr Branson again without realising that he really is simply human, can perhaps rush to sensationalism, but most of all, is possibly not as clever as you are and should have chosen a better guide like you did! December has arrived, and along with it all the excitement that goes with Christmas! Many visitors and residents to our gorgeous caribbean island find it quite interesting to adjust to a warm Noel - not least trying explain to the small kiddies how Santa secretly gets into houses that don't have chimneys! During this festive season, there are numerous events to attend to bring out the cheer in everyone. 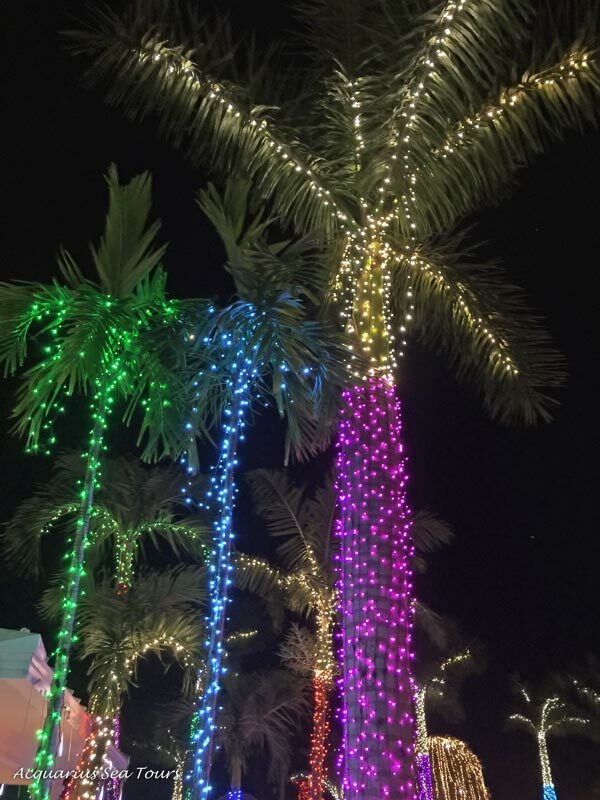 One of the highlights would be the Parade of Lights held at Camana Bay where boats adorned with all forms of seasonal colours and decorations parade for the public to enjoy. 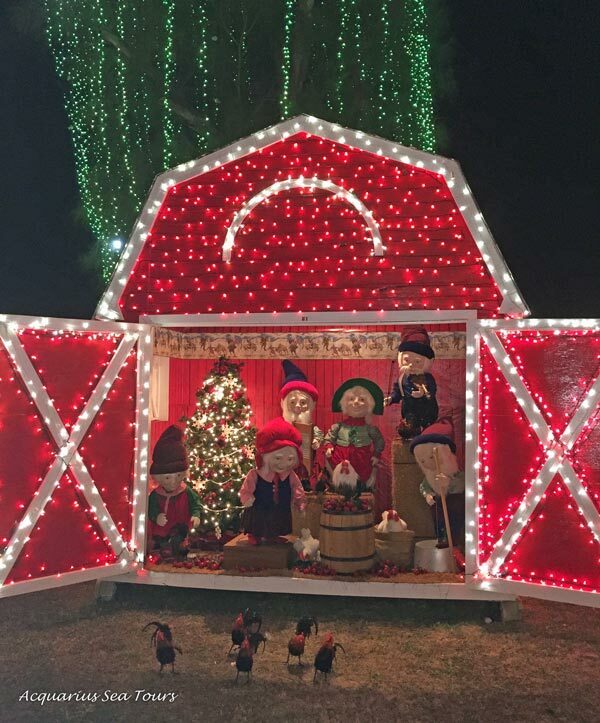 Not to be missed are the awesome and magical displays of christmas lights that some of the houses put on show. Some of these are so large we reckon they must only just finish putting them away a day before they start taking them out again for the next christmas! "Ooohs" and "aaaahs" are to be heard everywhere you go, and it is a wonder to see the looks of awe and delight on children's faces. We shall add some links to Grand Cayman event calendars below and hope that you all find something to make this christmas with us special. We wish everyone a safe, happy, healthy and loved Noel and hope to take you out for some christmas kisses with the stingrays! We also support a wonderful animal welfare organisation called Canine Friends - they work endlessly to help find homes for unwanted dogs and cats who might otherwise face a less than happy end. Feeling in the mood to splash out on a donation that does good? You can never know how much good it will do, and we thank you in advance!!! As if Captain Mario did not have enough food for thought yesterday! We have been watching, with some consternation, the stormy weather forecasted for the next few days - this wreaks havoc on tour schedules and leaves a lot of island guests unhappy about missing out on a visit to Stingray City. But there is no getting around 20-25 knot winds out in the North Sound and the unsafe conditions they produce. Frantic re-rescheduling becomes the order of the day and it is a horrible frustration not being able to assist everyone with alternative arrangements. These tropical storms are very often preceded by an incredibly still and beautiful day - the "quiet before the storm" is no falsehood - it's as if Mother Nature holds her breath for a moment before letting loose and puffing with all her might. But just to add the "cherry to the top", Mother Nature decided to add a Queen Bee to the mix, and of all the places for her to find a spot, it would be our diver's flag while anchored at Coral Gardens yesterday! "First do no harm" is a mantra that we try to live by, and so the crew decided the most prudent course of action was to take a slow, very slow, trip back to dock. We hope that our human guests enjoyed the somewhat extended tour - the little colony was still in situ this morning so we must assume that they rather enjoyed the ride! We have now had them moved to a safe spot and we hope they are happy. The irony of being less concerned about stingrays than of small flying insects was not lost on the tour group though, and we hope that they remember a truly unique tour for a long time to come! We always love a good thought provoking quote, and also enjoy adding them to the photos that we take on our tours. We take photos for our guests visiting Grand Cayman's stingrays and famous snorkel sites, and share them for free - please also enjoy the quotes page and some news from the Captain's Blog! Christmas is coming to the Caribbean! Yes. It seems that retailers promote christmas earlier every year, and yes, it would sometimes feel that the season of giving has become a season of spending. 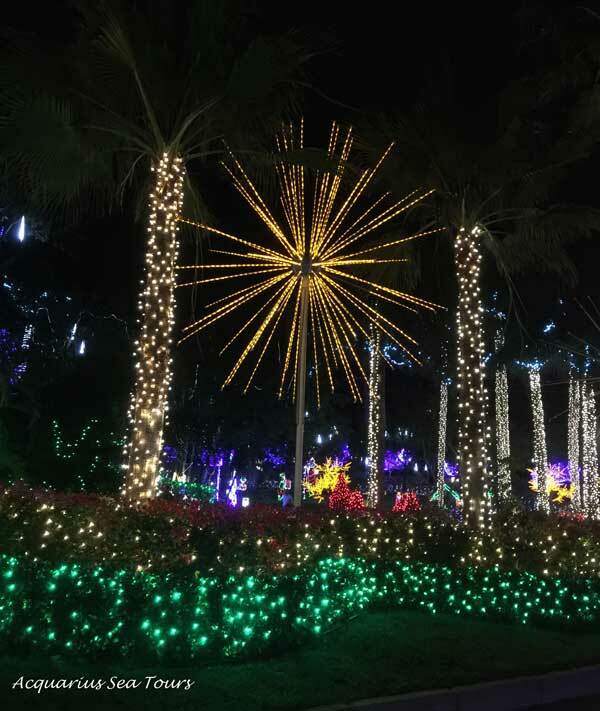 But, we can't help get excited about sparkling lights, the sound of bells jingling and all the festivities that are being planned on island! For many visitors to Grand Cayman, a christmas bathed in sun is odd but wonderful - families getting away from the snowy cold of home to the tropical warmth. Ironically, there are mid-summer days here when we just wish snow flakes could take the edge off the heat! Our daughter has just turned 5 and is getting so terribly excited about the merry season. At the age of 3 it took her well over a week to open all her presents up - she was quite content to open up one a day and play with it. At 4, this period was reduced to just 5 days - she progressed to opening up 2-3 presents per day, still seeming to want to savour them slowly. Our hope is that this sense of awe stays with her - not everyone is lucky to be so loved - we always wish to remember those not as fortunate. Camana Bay in Grand Bay is well known for hosting wonderful events over December, and on certain evenings you can even experience snow there! But to get the excitement warmed up, "Celebrations" has a christmas shop with amazing decorations and ideas, and we love their inspiration and oooh and aaaaaw at their beautiful trinkets and decorations. We have included pictures of some of their goodies and hope that they might be an inspiration to you. We hope that we might get the chance to wish many of you a very merry christmas in person, and look forward to welcoming on board! PIRATE'S WEEK GRAND CAYMAN 2015 - "AAARRRR"IVING SOON! In another life, Captain Mario would have been a pirate - definitely no ordinary Jack Tar (common sailor), rather a fierce but fair version of Captain Hook with the Jolly Roger flying the Caribbean winds! We know, because once he has his pirate gear on we can't get him to take it off again. Well ..... he does weaken at the promise of wenches and stolen treasure, but it takes serious bargaining! Launched in 1977 to entice visitors to the island, Grand Cayman has become famous for its unique Pirate's Week festival, and this year it is scheduled from 12 to 22 November. This means 11 days of street dances, competitions, tempting local food and drinks, pirate invasions and fireworks! It has become one of the islands biggest and most fun festivals, with entire families dressing up and part taking in the mock pirate invasion and kidnapping of the Governor. The 1650's to the 1730's was the most prolific piracy period of the island, with Edward Teach aka Blackbeard being the most infamous marauder of the Spanish galleons hauling booty from the New World. Every day of the week, each district hosts a family friendly Heritage Day to showcase traditional crafts such as rope making, silver thatch weaving and dances. Authentic Caymanian dishes are prepared and visitors can immerse themselves in genuine local custom. Throughout the week, there are events for festival goers of all ages to enjoy - a truly unique and memorable Caribbean experience! We hope that when you need a break from all the mutineering and plundering, that we get the chance to host you on an equally enthralling experience of kissing stingrays at the sandbar. Our crew truly enjoy what they do everyday, they love sharing Grand Cayman's beauty, and look forward to welcoming each new island visitor onboard. We are pretty sure that as youngsters, many of our guests enjoyed finding shapes of things in the clouds in the skies, and are sure that this fun activity gets handed down generation to generation. During this private tour, we were sad to witness some people poaching conch while at Stingray City - it is not conch season and they are so over harvested that they really need the season to replenish themselves at least a little bit. We hope that places like the Caicos Conch Farm will prove to be a great leader of conch farming so that the wild conch can flourish. So it was with a bittersweet feeling that we witnessed this beautiful conch shaped cloud on our journey back to dock - lapping up the beauty of this incredible sight whilst feeling a tinge of sadness that the rule protecting these little creatures had not been observed. All in all, a stunning end to another amazing tour soaking up the beauty of Grand Cayman!